The firm performed a FEMA flood map amendment for a proposed residential project located within the Rio Coamo floodplain area. The effective FEMA flood map located the proposed project within the regulatory floodway limits. The study was performed to revise the existing FEMA study. The Rio Coamo floodplain is characterized by an unconfined flow area where the overland flow direction is different than the channel flow direction. 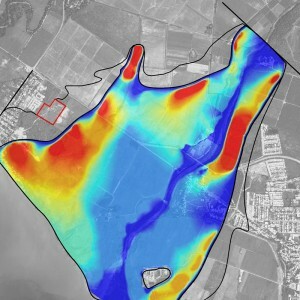 A 2-dimensional hydraulic model was used to simulate hydraulic conditions and flow patterns along the floodplain. The study concluded that the model prepared by FEMA has several deficiencies and new regulatory limits for the study area were established based on the revised hydraulic model.